Enter our free garden pictures contest below to win a professional garden design or a fabulous wall fountain. Details of the prizes and contest rules may be viewed on our Photo Contest Page. The contest has two divisions, one for your garden photo and the other for your favorite pet photo. Below are Some of The Entries Received! Scroll to the Bottom of the Page to See All The Entries! One of my favorite garden spots is this garden bench. It is situated in a nice shady spot. 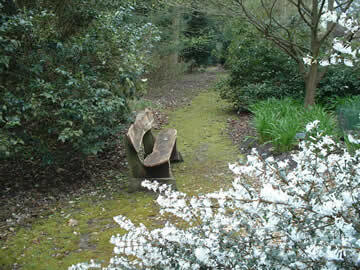 It is surrounded by green moss that adds to a soft and peaceful atmosphere. The chirping birds provide me with merry music that lifts my soul. It is a wonderful retreat where I can relax and forget about all the cares of the world. Join me now in the wonderful world of gardening by submitting your favorite garden pictures! You may also scroll down to view other garden photo submissions. While you are there, why not rate your favorite entry? My favorite reading spot in my garden. Why I love my garden. Look I used some garden design principle! My kids enjoying our garden. Strange visitors to my garden. To increase your chance of winning, add a picture caption and write a good story about your picture! It is easy to enter all you need to do is to fill in the form below, browse for your picture on your computer, and write a short story about it and click on submit. Don’t worry too much about the size of your picture, if it is too large, my software will resize it. Oh yes! Don’t forget your email address; else I can’t inform you of the prize you won! For a reminder of the fabulous prizes you can win and for the rules visit our photo contest page. Enter the Garden Picture Contest Here! Enter the contest now for an opportunity to win that fabulous wall fountain. Just imagine how nice it will look on your wall! This is my spiderwort in bloom. I love the green of the leaves and the flowers are a very nice shade of purple. It blooms for a long time. Here is flashing light dianthus in bloom. You can see sedum blooming yellow just at the edge. The red and yellow really compliment one another. This is a picture I took in my mom's garden...since I don't have a garden of my own, I greatly enjoy her garden.. Here is an interior view of my gazebo.